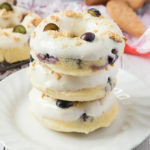 These Baked Blueberry Cheesecake Doughnuts are filled with juicy blueberries and topped with the most amazing cream cheese frosting and biscuit crumbs. Ever have one of those weeks which is just like “bleurgh”. That’s been my week. Super emotional, headache filled and stressful. I’ve been beyond busy, but also felt kind of rubbish. And ill. And annoyed that I got behind on my baking. There just aren’t enough hours in the day or energy in the system for everything I need to do. Anyway, I’m consoling myself with one of these Blueberry Cheesecake Doughnuts! And I already feel much better! I decided that you needed another hybrid dessert in your life. I mean, there’s no such thing as too much dessert, right? 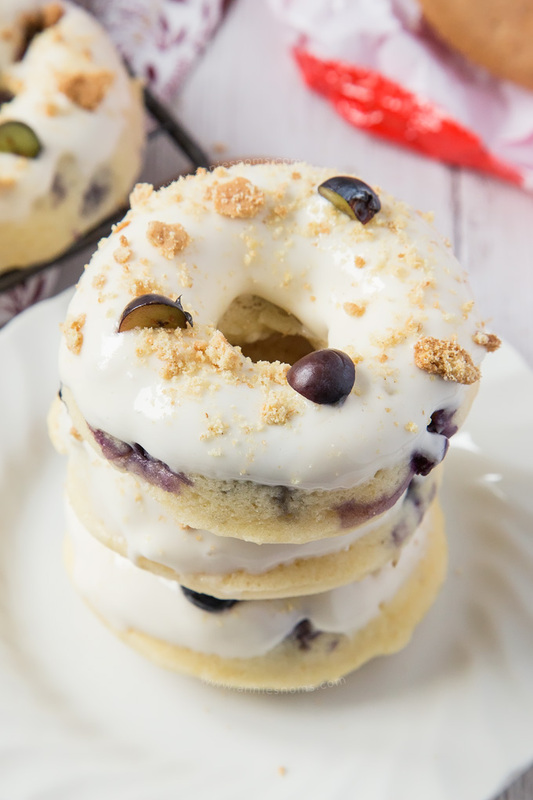 Be it a “normal” dessert or a hybrid one, awesome desserts come in all shapes and sizes and these Blueberry Cheesecake Doughnuts are no exception. I added a little cream cheese to my doughnut dough and filled it with juicy fresh blueberries. This did make it quite difficult to pipe the dough into my pan… But it was worth it. Because these taste insane. I think I had particularly large blueberries… if you had smaller ones then you wouldn’t have a problem fitting the blueberries through the piping nozzle! I then topped these doughnuts with smooth, sweet cream cheese and plenty of biscuit crumbs. Soft, sweet and a tiny bit crunchy; these are some seriously epic doughnuts, which are bound to disappear quickly! 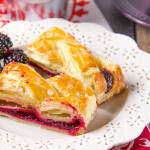 Since these are baked, they are ready super quickly and not quite as bad for you as the fried variety. 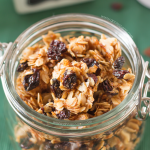 I’m not saying that these are healthy… But I can think of worse ways to indulge yourself! Like this Double Chocolate Skillet Brownie for instance. Definitely not diet friendly, but perfect for that time you want to properly treat yourself. 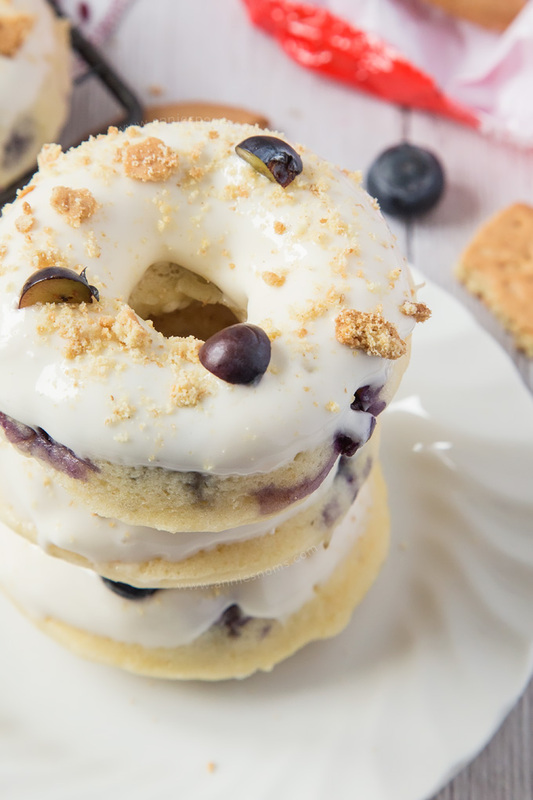 For the days when you’ve had a long and stressful day, but don’t want heaps of chocolate; these Blueberry Cheesecake Doughnuts are just the ticket to brighten your day! Preheat the oven to 180C/350F and spray two doughnut pans with cooking spray. I used Wilton Bake Easy. If you only have one doughnut pan, you'll have to cook in two batches. Place flour, baking powder, salt, blueberries and sugar into a large bowl and stir briefly to combine. Leave to one side. Place cream cheese and egg into a jug and beat with a spoon or fork until smooth. A few tiny lumps of cream cheese is fine. Add in the milk and vanilla and stir to combine. Lastly, add in the cooled melted butter and mix. It may look ugly at this stage, don't worry! 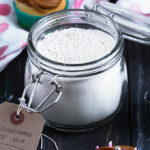 Pour the milk and egg mixture into your flour and blueberry mix and gently mix with a wooden spoon until you can see no lumps of flour. Don't beat or be tempted to over mix; just stir until combined. If your blueberries will fit through a 1/2 inch plain nozzle, fit the nozzle to a piping bag and fill the bag half way with doughnut batter. Pipe an even round into each doughnut hole. Alternatively, if your blueberries are too big to fit in a piping bag (mine were!) then use a teaspoon to spoon the batter into each doughnut hole. You want each hole in the pan to be just under full. Place in the oven for 8-10 minutes, until risen and an inserted skewer into the centre comes out clean. Tip the doughnuts onto a wire rack and leave to cool completely. 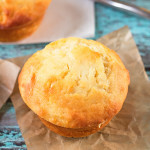 Once cool, make the glaze: Place the cream cheese, vanilla extract and salt into a medium sized bowl and beat with a hand mixer (or place in your stand mixer) until light and fluffy. Add in the icing sugar 1/4 cup at a time, mixing in between each addition until well combined and smooth. Repeat until all the icing sugar is incorporated. Glaze should not be incredibly runny, but not a thick, piping consistency either. It should stick to the doughnuts without too much running down the sides. Dunk one side of each doughnut into the glaze and place back on the wire rack to drip/set. 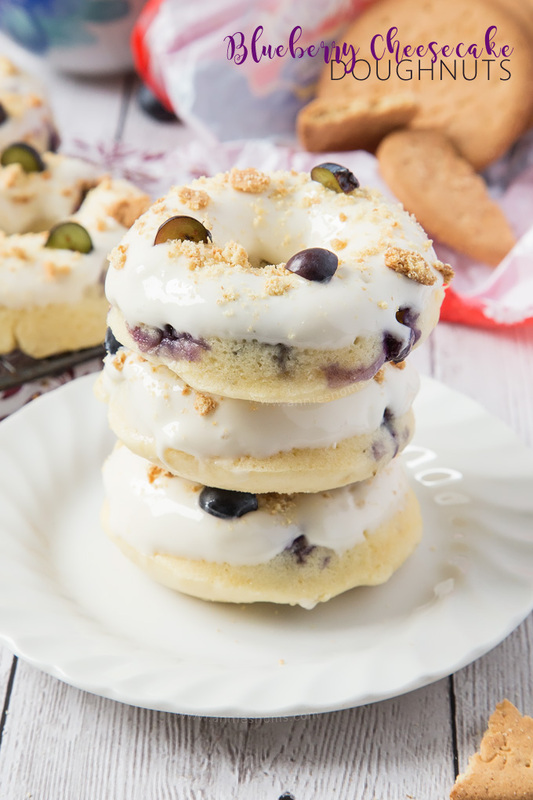 Once all doughnuts are glazed, sprinkle crushed digestives/graham crackers on top and finish off by sprinkling some fresh chopped blueberries on the top of each doughnut, if desired. 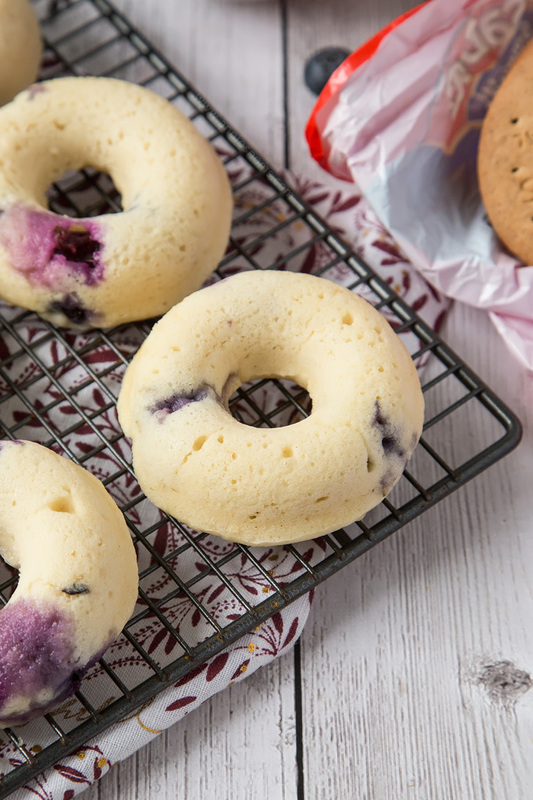 Blueberry Cheesecake Doughnuts will keep in an airtight container, in the fridge for 3 days. 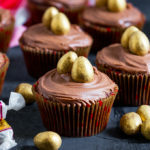 I’m amazed these are baked! They look so fantastic and like you said not health food but less to feel guilty about! I love these! Yes, I have had one of those weeks… this one in fact! 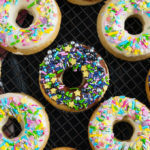 I hope you’re on the upswing now 🙂 I do love the fact that these lovely donuts are baked rather than fried – few calories and less mess. That sounds like a win-win for sure! Amazing combination of cream cheese and blueberries. I’m impressed that the donuts are stuffed with bagels. That’s awesome! PS: Amazing photos! Oh my goodness I need to make baked donuts more often. Love the glaze! These doughnuts look perfect! I love the addition of the cream cheese! These sound and look amazing!!!! 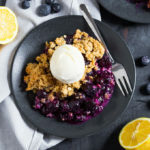 I love blueberries and cheeecake! These donuts sound (and look) amazing! How amazing! All the food I love in one. Thanks for sharing. I’m a serious cheese-cake-aholic! So these are my cup of tea! i love that they are baked as well! Delish! These were super easy to make. Thankfully my son snuck a bite & said it was terrible, which cued me that I had forgotten to add the sugar!! Added it right at the end & all turned out well. More like a blueberry muffin consistency. The only recommendation I would make would be that I would have appreciated more photos of the process. Otherwise a hit!